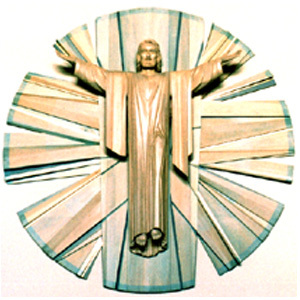 ANDRÉN & KNAPP - STATUES, "Jesus-Temple Terrace"
This 8 ft diameter circle and statue are made of maple wood. It is in Christ Our Redeemer Lutheran Church in Temple Terrace, Florida. It hangs above the main altar and below a stained glass window with strong blue colors. In order to connect the carving with the window and the altar we used an analine dye to stain some of the wood blue.